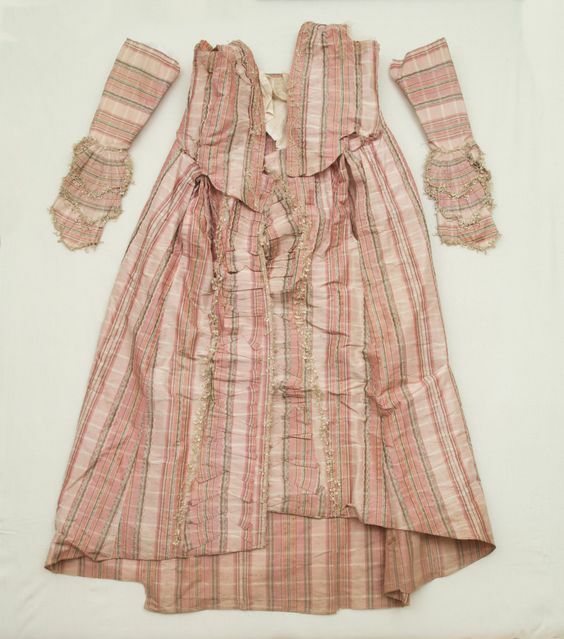 It's commonly known that 18th century dress textiles were made and remade and remade again. A great many extant gowns in museum collections show evidence of being altered - some of them in the 19th century (darts, omg) and some of them in the 18th century. Some of my favorite museum pieces are 1840s gowns made from great great grandma's old 1740s Spitalfields brocade. Can you imagine slicing into a century-old textile and refashioning it into a gown for yourself? 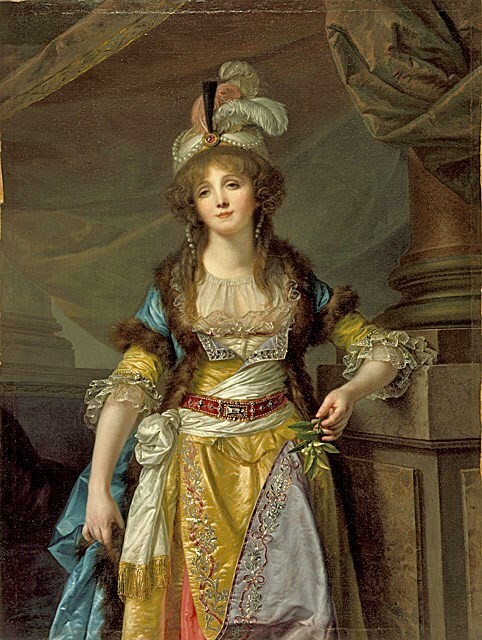 This year for the Costume College gala I want to finally make my version of the Madame Guimard portrait. I've broken down the many layers of this stage costume into three main parts: the robe, the gown, and the petticoat (or possibly harem-type pants, which is what I'd like to make). 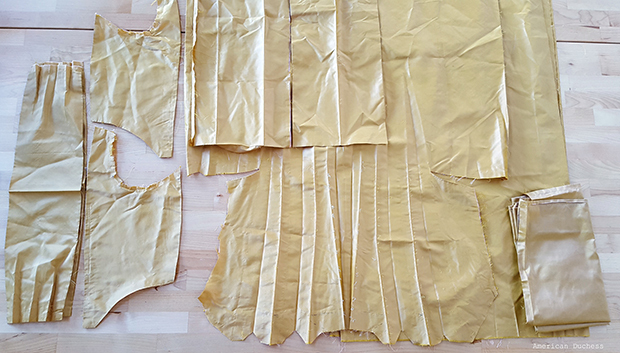 For the gown, the yellow part, I plan to make an Italian gown that can be worn on its own. I love versatility. I happen to have a yellow gown already. Or, well....I had. 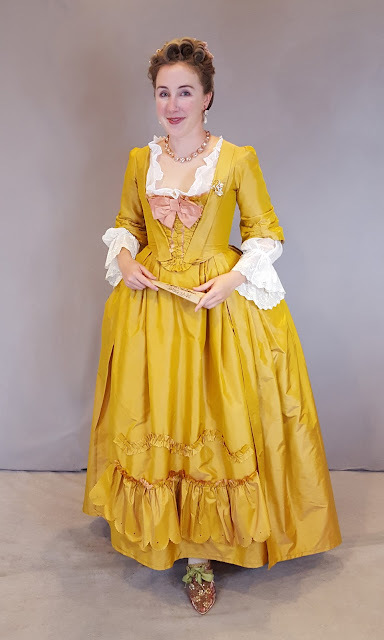 My Costume College gala dress last year was a 1750s gold shot taffeta English gown. I loved it, but I also love cheese and Starbucks, so I can no longer get the thing on (along with most of my other costumes. Joy). Here enters the idea to pick apart and re-make it. Alas, this gown - in this incarnation - is no more. I still have the petticoat and stomacher. What a great way to study a mantua-maker's experience. In picking apart the dress, small but significant discoveries come to light. Some are really obvious - boy these hand stitches are easy to pick, while my regret in that one machine-sewn seam is palpable. Also, the amount of fabric in a pleated back, and a particularly cool discovery of pulling apart pleated robings to find they form that recognizable 1770s squared-off bodice front perfectly. Additionally, there's no need to re-cut or sew the sleeves. They're still assembled, sans cuffs, ready to be set in again and re-trimmed. The English gown picked apart. I left the creases in to show what everything used to be. There's quite a lot of textile here waiting to be refashioned. The next step is to press all this out and carefully re-cut what's needed. I look forward to the discoveries at this part of the project too, and sharing the process with you. That will be really fun to wear, looking forward to seeing it come together. I don't know why, but there is something very satisfying about remaking a gown. Maybe it's the part of me that loves Tetris but I love re-jiggering it all and transforming something that didn't fit or I wasn't happy with into something new and exciting. OMG this is so exciting. That outfit is madass! I can't wait to see it in its many textiled fabulosity! ALL the layers! I'm worried I won't get them all done, so the plan is to get the yellow gown out of the way and then if I run out of time on everything else I can wear just the yellow gown to the gala. On a MUCH smaller scale, I've been planning to do the same thing to two knee length skirts that I made 5ish years ago. The waist bands are too small and I've already stolen the buttons off one for another project but I realized that the skirts could easily be reset into new waistbands and I can change the pleat pattern if I wish. The only thing holding me back is that I don't have enough of the original fabric to make new waistbands but I could cut the old very wide waistband down and piece it or find an appropriate match/contrast. Keeping something that doesn't fit, or getting rid of it doesn't help you at all. It's great that you'll get a new gown out of the fabric. Plus, you can't wear the same gown out again can you? someone might notice ;). Even though I could never do something like this myself. I'd feel pain for every sticth I unpicked, thinking about all the hard work that is going to "waste" (I know it isn't, but that's just how I feel). I sometimes get in ball gowns or wedding dresses to be re-sewn, and I even feel bad for the original designer, unpicking all their hard work.